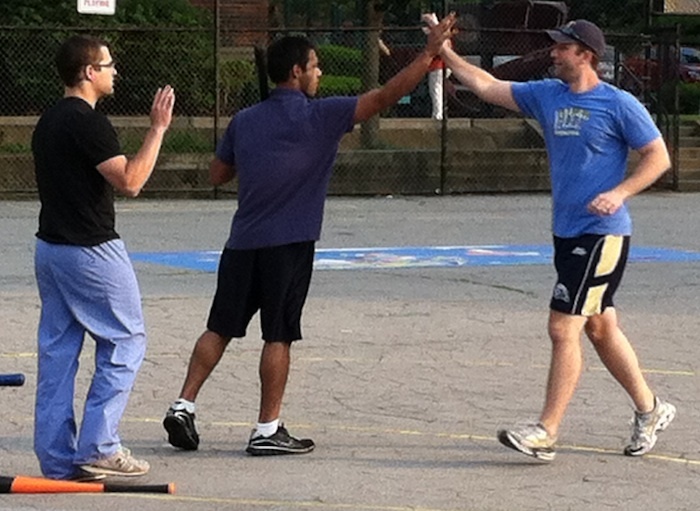 A week after the Caucasians beat Bobby Brown in the most lopsided manner possible, the Fish Sticks kicked them while they were down, easily defeating them 15-3. Downtown headed into week 4 without their rookie and best player so far, Helal. To replace him, they signed Josh, who would play for Bobby Brown for the first time in a year. Unable to find a solid pitching option other than Gaurav, they put Josh on the mound to start against the Sticks. He got off to a solid start in the top of the first, retiring Ivan for the first out of the inning. Joey followed with a one-out single, but Josh stranded him at first when he got Blose to ground out to left to end the inning. The Sticks would play their week 4 games without Dinger, who would miss games for the first time in his career. Missing their #1 starter, the Sticks sent Joey to the mound to start against Bobby Brown. Unlike Josh, he got into trouble early. Mark led off the game with a single, and the next batter, Brad, crushed a two-run homer to deep left-center field, putting Bobby Brown up 2-0. Joey settled down after the home run, getting Gaurav and Josh to fly out to the mound to end the inning. The Sticks got to work patching the 2-0 deficit in the top of the second. Vassallo led off the inning with a double, and scored when the next batter, Ivan, doubled. With a runner on second, Joey tied the game with a triple, scoring Ivan and making the score 2-2. With no outs and the lead runner on third, it looked as if the Sticks would have a big inning. But Josh escaped the jam, getting Blose and Vassallo to fly out for the first and second outs of the inning, maintaining the 2-2 tie. Bobby Brown quickly regained the lead in the bottom of the second, when Mark led off the inning with a solo blast, making the score 3-2. Joey got Brad to fly out to the mound for the first out of the inning, but Gaurav followed with a one-out single. He was stranded at first, however, as Josh grounded out to left to end the inning. After two relatively solid innings on the mound, the wheels fell of for Josh in the top of the third. The Sticks went on an offensive tear, recapturing the lead and never looking back. Ivan led off the inning with a double, his second of the game, and scored when Joey followed with a double. After only three at-bats, Joey was a home run away from the cycle. With the game tied at 3-3, Blose doubled, the third consecutive double for the Sticks, scoring Joey and giving the Sticks a 4-3 lead. With Blose on second, Vassallo crushed a two-run homer, and the Sticks had a three-run lead. After an Ivan triple, Josh finally recorded the first out of the inning when Joey rounded out to left. But the next batter, Blose, blasted a shot to right-center, a two-run homer that put the Sticks up 8-3. Vassallo followed with a homer, his second of the inning, and the back-to-back homers put the Sticks up 9-3. After giving up 7 runs, Josh got out of the inning when Ivan flew out to the mound for the second out. Joey struggled through the first two innings, but got control of the game in the bottom of the third. He retired Mark and Brad in order for a scoreless inning. Josh retired Joey for the first out of the top of the fourth, but Blose followed with a one-out double. The next batter, Vassallo, doubled, scoring Blose and extending the Sticks lead to 10-3. Josh avoided another big inning, getting Ivan to ground out to left for the second out, stranding Vassallo at second. Joey cruised through the bottom of the fourth, as Gaurav and Josh were sent down in order and the Sticks maintained their 7 run lead. The Sticks continued to pour it on in the top of the fifth. Joey led off the inning with a solo homer, making the score 11-3. Joey had become the third player in league history to hit for the cycle. Josh retired Blose for the first out of the inning, but Vassallo and Ivan followed with back-to-back homers, the second time the Sticks had consecutive homers in the game. The blasts put the Sticks up 13-3 and chased Josh from the mound, as Bobby Brown turned to Gaurav to get out of the game without further damage. But the first batter he faced, Joey, hit a solo shot, his second homer of the inning, and the score was 14-3. The Sticks had hit back-to-back-to-back homers, and one more would be a league record. But Gaurav got Blose to ground out to left to end the inning. With an 11 run lead, the Sticks turned to the bullpen to close out the game as Ivan came to the mound for his first career pitching appearance. Mark led off the inning with a single, but Ivan retired the next batter, Brad, who flew out to center. He then fanned Gaurav for the second out of the fifth. Gaurav got Vassallo to ground out to left for the first out of the top of the sixth, but the Sticks added one final insurance run when Ivan hit a one-out solo home run to left-center, his second homer of the game. Gaurav got Joey to fly out to the mound to end the sixth with the score 15-3. The Sticks put Blose on the mound to close out the game, and Bobby Brown was unable to chip into the 12 run deficit in the bottom of the sixth. Blose retired Josh and Mark in order, ending the game. 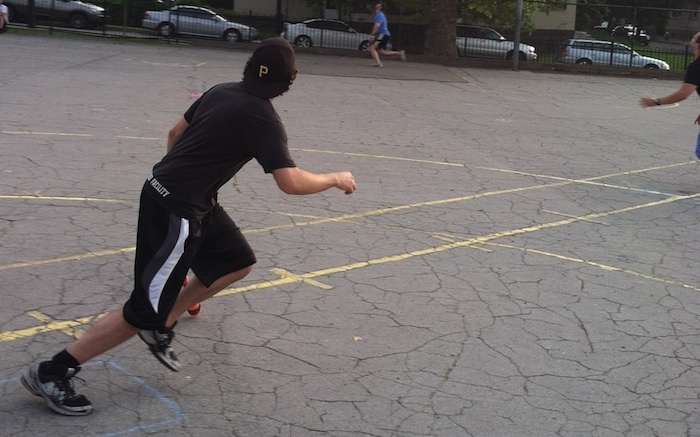 The win moved the Sticks to 4-3 on the season, in a three-way tie for first with the Caucasians and Ham Slams. The loss dropped Bobby Brown to 2-5, two games behind the other three teams in the standings. – The Sticks pounded Bobby Brown for 18 hits, their best performance of the season. 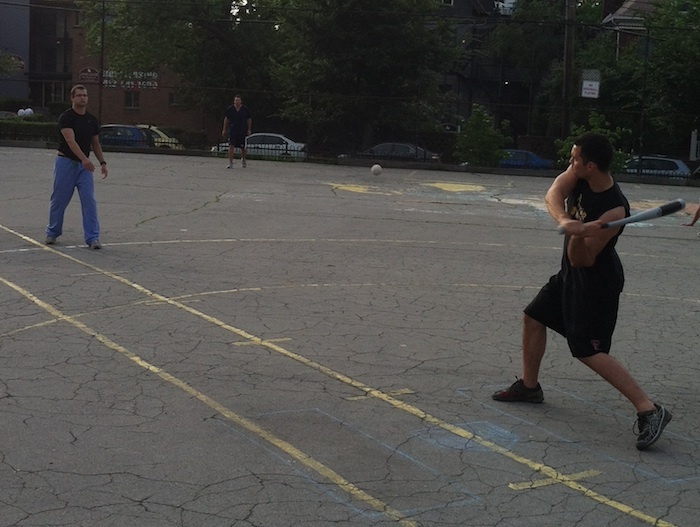 – Joey pitched 4 innings, giving up 3 runs on 4 hits, for the win. – Joey became the third player in league history to hit for the cycle in this game. Frosty hit for the cycle in week 2 of this season, and Blose was the first to accomplish the feat when he did last season. – The Fish Sticks broke the single-game team record for doubles with 7. The previous record was 6, held by the Caucasians from earlier this season. – The Fish Sticks hit back-to-back-to-back homers, becoming the fourth team in league history to do this and the first in 2012. – Joey led the Fish sticks offensively, going 5 for 8 with a single, a double, a triple, two homers, 3 runs scored and 4 RBI. – Mark led Bobby Brown at the plate, going 3 for 5 with 2 singles, a homer, 2 runs scored and an RBI.